To hear so many Soldotna residents talk about friends and loved ones that have been “in Kasilof” for years to even decades might give the impression that Soldotna isn’t a prized place to call home, what with so many choosing to relocate to the neighboring community 30 miles down the road. Soldotna may be welcoming to those wanting to live there, particularly with its unique roots as an outgrowth of the U.S. Homestead Act, but throughout its history the community has only accommodated the living. Lacking a cemetery, once Soldotna residents died they no longer had a place in the city. With the dedication and opening of the 17-acre Soldotna Community Memorial Park on East Redoubt Avenue on Sunday, that is no longer the case. 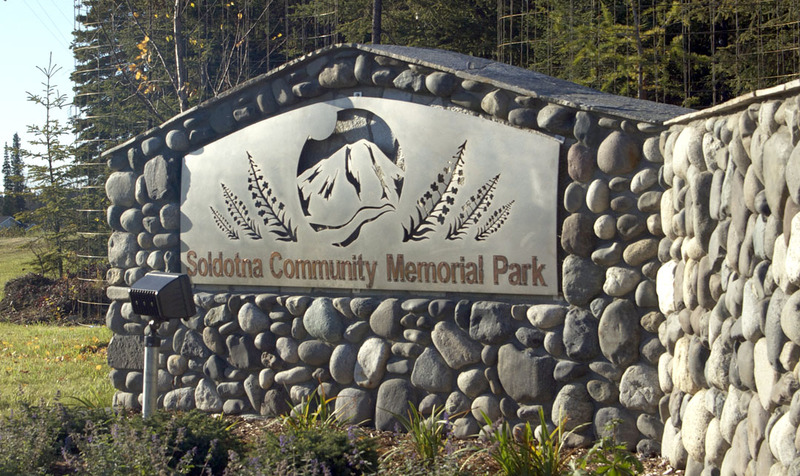 “We can say that it is generally dedicated to the history of the people of Soldotna — a respectful and very beautiful final resting place. What I think is most important is that we think of the individuals that will be interred here. Some passed long ago, and many of us that will rest here may not pass for many years to come,” said Soldotna Mayor Peter Micciche in the afternoon dedication ceremony. The park will serve as an internment site for current and future Soldotna residents, for former residents who have died and been laid to rest elsewhere whose families want to bring them home, and a place to honor others not physically resting there through memorials. For Katherine Parker, the memorial park represents the completion of the decision she and her husband made to move to Soldotna in 1961. She and Charlie chose to homestead, to raise their family and make their life in Soldotna when it was still a tiny frontier town straddling a bend in the Kenai River. Both contributed substantially to the formation of the community — Charlie as a surveyor and Katherine as a reporter for the Cheechako News and member of the Soldotna Historical Society, among many other involvements. Yet, as with others integral to the history of Soldotna, when Charlie died in 2001, he couldn’t be laid to rest in his chosen home. Katherine Parker and her daughter, Pattey, pause during a walk around the memorial park grounds Sunday. 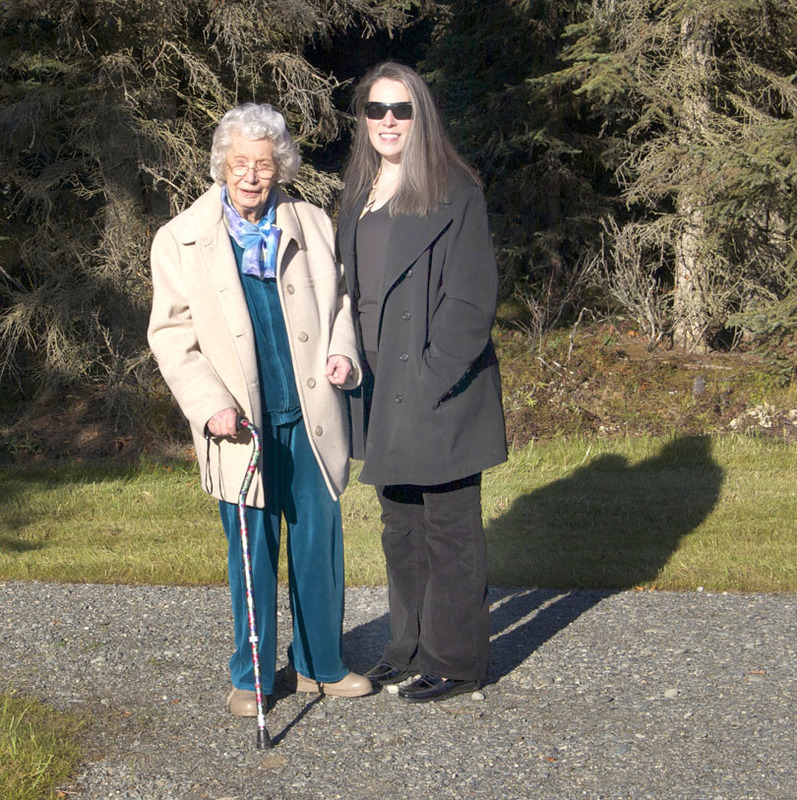 Katherine Parker was one of an army of Soldotna residents who have been pushing the city in earnest since the early 1990s to establish a cemetery. Kenai has one 15 miles away, though with town rivalries over the years no one — as the old joke goes — from Soldotna would be caught dead being buried in Kenai. Instead, they used Kasilof’s Spruce Grove Memorial Park. “Kasilof is twice as far (than Kenai), but Soldotna people would rather be buried in Anchorage than Kenai. Dad would roll over in his grave if we buried him in Kenai,” Pattey said. 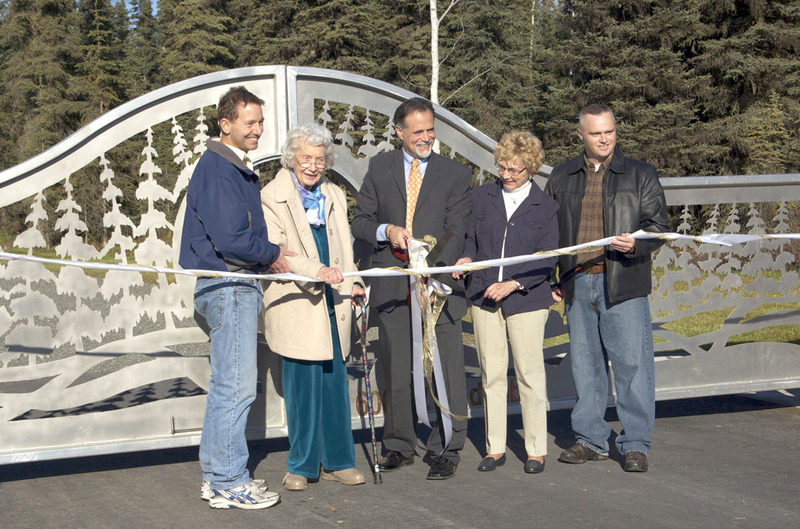 On Sunday, Katherine participated in the ribbon-cutting ceremony in front of the park’s burnished aluminum gate depicting a tree-lined stretch of Kenai River with Mount Redoubt in the middle, designed by Erin Micciche and Nancy Casey, and created by Scott Hamann of Metal Magic. Parker, Mayor Micciche, Jay Rohloff, Barbara Jewell and Eugene Fowler — other members of cemetery task forces and committees over the years — helped cut the ribbon. The park will be a place to reunite the Parker family. Nancy — Katherine and Charlie’s daughter — died in a drowning accident as a child in 1965. They buried her on their homestead, under a spruce tree on a wooded hillside down from their house. Now 87 and recovering from a broken hip, Parker isn’t able to make the walk down the hill through the woods to visit her daughter. She plans to have Nancy moved to the memorial park with Charlie. “You know, I can’t get to her grave anymore. I used to always go down there,” Katherine said. The Parkers aren’t the only ones to know the tragedy of losing a child. The memorial park includes flat sections of grassy lawn for graves, both with flat monuments and another section for upright monuments, a columbarium for cremated remains, and a tree-lined, circular section for children to be buried, with no cost of city services to families who have lost a child from birth to age 7. Though the care shown to the design and landscaping of the area can in no way erase the pain felt at having to use it, having somewhere beautiful and close to inter children will help families hold their beautiful memories close, as well. Terri and Jerry Pate share a quiet moment in the children’s burial section of the memorial park. Terri Pate plans to move her son, Ezekial Thomas Miller, here. Zeke died in 1999 at age 2.
a moment Sunday in the children’s area, where they will move Terri’s son, Ezekial Thomas Miller, who died at age 2 in 1999 and has been buried in Kasilof. Soldotna was his home, just as it has been for Terri since 1987, and for Jerry since 1981. Having to bury Zeke in Kasilof is what led the Millers to get involved in efforts to build a cemetery in Soldotna. “It’s for our families. Until you’re facing an actual death you don’t realize, ‘Wow, we don’t have anywhere to go for people,” Terri said. Now they will be able to visit Zeke close to home. “And we’re going to be over there,” said Jerry, indicating the lawn designated for gravesites. The Millers said the park turned out beautifully and thanked the mayor, council, cemetery committee and task force members, city employees, volunteers and everyone else involved in making it happen. “Once the decision was made (to build the cemetery), we figured we’d just let them hash it out,” Jerry said. “And they came up with something gorgeous,” Terri said. Photos by Jenny Neyman, Redoubt Reporter. The Clark family — Jim, Brandi, Aanson and Brie, check out the view of the Kenai River from an overlook at Soldotna Community Memorial Park. beautiful place to go for walks. Jim, with the Boys and Girls Club, drove a van shuttling ceremony attendees into the park and back to their vehicles. He and Brandi brought along their two kids, Aanson, almost 3, and Brie, almost 2, for a tour of the park. “It’s very peaceful. We go for a lot of walks around here,” Brandi said. On Sunday it was difficult to tell which element of the park the kids were more enthralled with — the nearly head-sized cookies they got from the refreshment table, or the path into the woods leading to an overlook of the Kenai River. An observation deck and benches are planned for the area, where visitors can scatter ashes of loved ones, or simply enjoy the view, as Aanson certainly did. “Duckies!” he shouted, so excited at a glimpse of movement in a catchments pond below that he momentarily lost interest in his snack. As a veteran himself, Jim said that he was particularly pleased with the veterans’ memorial in the park, designed in collaboration with local veterans groups. The area includes insignias of all five branches of the military in front of three flagpoles. On Sunday, that’s where a flag ceremony and gun salute were performed, with TAPS played behind a screen of trees. Honoring veterans is one of many reasons why the park is vital to the character of Soldotna, Micciche said. Soldotna had a bridge to name after one of its soldiers, David Douthit, who died in the first Gulf war, but didn’t have a place for his body. 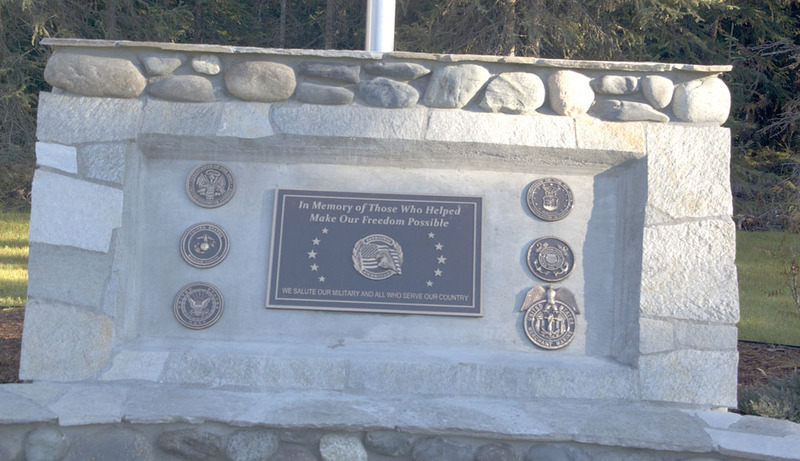 “Soldotna named the new Kenai River bridge in David’s honor, but had nowhere for his body to rest — an issue that the families of Soldotna veterans will never face again,” Micciche said. 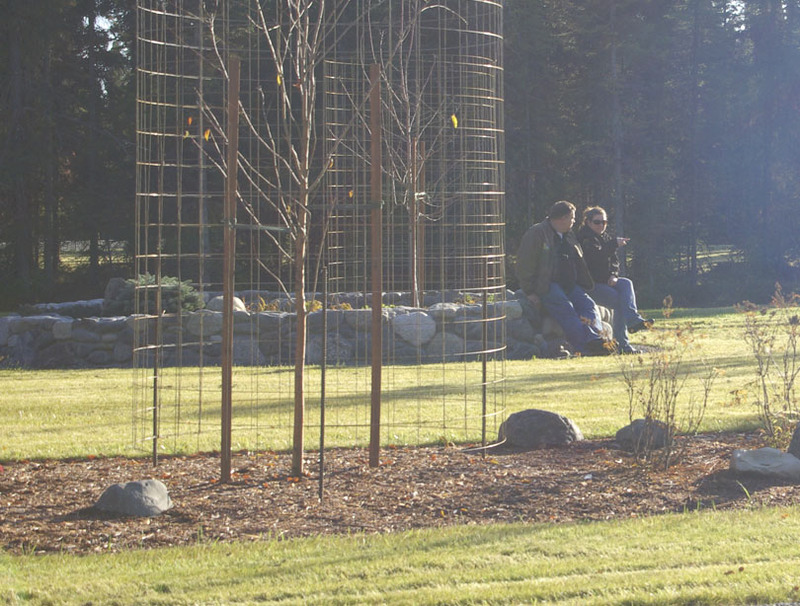 The park also includes a memorial rock wall, braided to represent the braids of the Kenai River, with metal railings where plaques honoring the lives of those interred elsewhere may be affixed. With design touches like that, all set against a backdrop of trees, the park is to be a serene place to remember loved ones. But it wasn’t long ago that the cemetery sparked much less peaceful feelings. Debate over where a cemetery would be located divided many in Soldotna, with the prevailing group wanting it on the 7-acre East Redoubt parcel of city land, to which the Kenai Peninsula Borough added 10 more acres, and others suggesting different locations — by the airport, near ARC Lake, along Knight Drive. After years of wrangling and debate, the park finally is complete. On Sunday, enjoying the providence of a sunny fall day, Micciche was as pleased to have the controversy laid to rest, and even more so for having a place for Soldotna residents to rest. “I couldn’t be any prouder of the outcome and I couldn’t be any prouder of our community for coming together and making this park the final result,” he said. With her daughter and husband to be moved to their new resting place, she plans to join them there one day. “That’s going to be a long time from now, Mom,” Pattey said. My son and I drove through the park yesterday. It is beautifully designed. Great job! I am sorry you found it necessary to include the caustic remarks by the Parkers about Kenai. Ruined the article for me . I am sorry Kenai is so caustic to Soldotna, that ruins a lot more than an article.